SYDNEY Manufacturing Company (SMC) changed the face of bulk material conveying in 1997 when the company introduced its exclusively designed Sidewall Return Drag Conveyor system, available from Heat and Control Pty Ltd .
With its unique captive paddle design, bulk materials from delicate tomatoes to small chunk dog food could now be conveyed with little or no damage to the product. Cleanup is fast and easy and the system requires low maintenance. As a result, over 1000 satisfied users have reported exceptional performance across a wide range of product applications. While incline bends for the system have been available for some time, SMC has now successfully designed a horizontal bend into the system for added efficiency. Either right or left-hand bends from 5° to 90° with a centreline radius of 48 in., (in 5° increments), are available. This new design further helps eliminate the need for a secondary drive and conveyor. The company asserts there is no sacrifice in performance as the product is conveyed with the same gentle handling for which the SMC system has become known. Production speeds can be maintained and the self cleaning feature, a major plus with the sidewall return design, is still a strong advantage of the system. 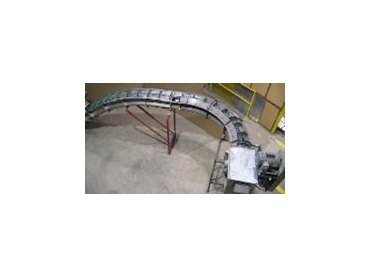 SMC will size the horizontal bend Sidewall Return Drag Conveyor system to meet the application and is available for the company's SWR 9 through SWR 24 conveyors. Capacities range from 1900 CFH to 20,000 CFH with speeds from 100 to 150 fpm.